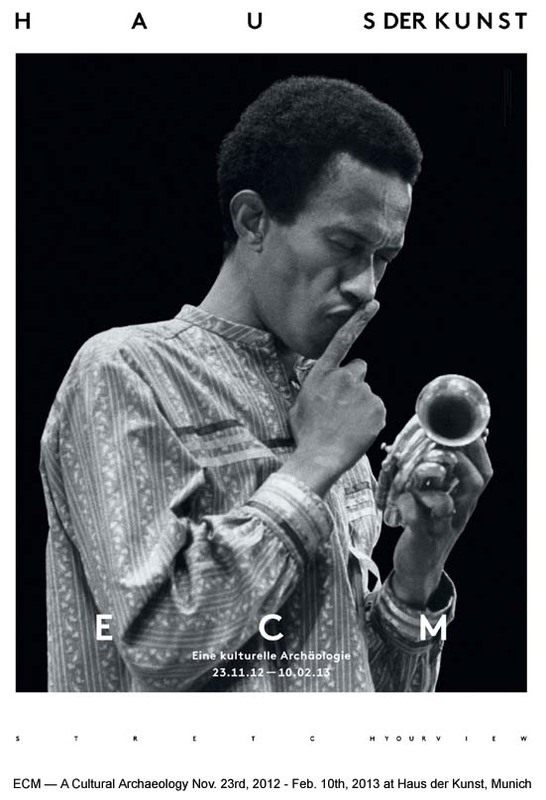 Don Cherry ponders and asks his toy trumpet to be quiet on the exhibition poster. I’ve been thinking a good deal about what stuff and ideas should be turned into exhibitions recently. In the last couple of months I have had to deliver two talks – one dealing with exhibition design and the other with house/museums and I began to wonder if the documentation and communication of some ideas just work better as books or blogs or records. This was going through my mind when I visited ECM: A Cultural Archaeology at the Haus der Kunst in Munich earlier this month. I was also thinking about the Touch event staged in London at the end of last year and about Jon Wozencroft’s heartfelt naming of a significant part of the Touch project as an act of sociability – reaching out to a community. I knew that the ECM display would be cooler…a longer history, a huge catalogue…with far more cultural baggage to be opened up and pored over. The exhibition guide offered a ‘sensory field’…I liked the sound of this. There are many pieces of music that have been recorded and released by ECM that I have hugely enjoyed over the past 37 years (I came ‘late’ to them…their first record was released in 1969)…but I have also appreciated the less obviously musical releases such as Jean Luc Godard’s sprawling soundtrack for Histoire(s) du Cinéma. Maybe the exhibition would be an attempt to extend the aesthetic of ECM rather than just document it – I guess I was looking forward to some kind of a Gesamtkunstwerk. 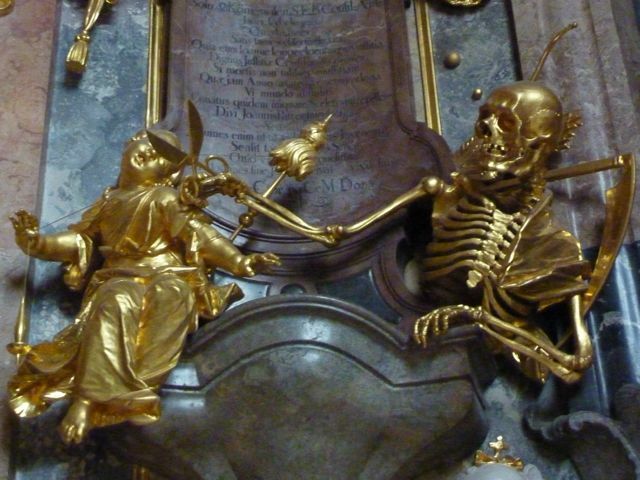 It was maybe with this in mind that I had suggested to my companion, Jon, that we visit the Asamkirche on the way to Haus der Kunst. This is a Baroque church squeezed into the busy Sendlinger Straße in central Munich. Architecturally it is a fairly straightforward oblong with 2 long, high galleries and an apsidal end…but its decoration is where it moves into extreme baroque – dripping with gilding and sculpture, trompe l’oeil painting and draped fabric rendered in stone. As if to order there was an organist practicing as we entered the church but whether it was the repertoire of the musician that seemed to just slide over the surface of the building’s interior or the museum/mausoleum like air of the place, the experience didn’t have the resonance that I had hoped for. The exhibition began with a film from 1971 by Theodor Kotulla: See the Music. This featured Marion Brown and Leo Smith on a winter trip to Munich with Manfred Eicher playing bass. Long thought lost, this was a gem of documentary filmmaking showing the band in rehearsal and walking in one of Munich’s snowy parks. It heralded the best of what was to come in the show…the surprising effect of film in this context. At the same time it was a pre-echo of another dominant theme of the exhibition – the presence and drive of Manfred Eicher as the founder and head of ECM. As if to get it out of the way, the next exhibit dealt with the great behemoth that is Keith Jarrett’s Köln Concert album. This was the record that cemented the ECM image, making its way into thousands of homes in the 1970s. But it was clear at this point, looking at carefully selected photographs and LP sleeves, that we would not be taking a journey into the socio-cultural nexus of ECM…even at this stage there was a sense that this was edited history…all control and, somewhat perversely, no improvisation. The real delights in this room turned out to be a number of TV programmes with interviews with Jarrett and Eicher, a very staged wall of master tapes from the ECM vaults and the wonderful film by Anri Sala, Long Sorrow. When I saw this film in London at the Serpentine Gallery it was from time to time accompanied by a live saxophone improvisation by Andre Vida…here it was presented on its own…a rather drier affair but worthwhile nevertheless. The film shows the saxophonist Jemeel Moondoc playing outside the window of a tower block…the camera roving first around the room and then in space in the open air. The mystery of the levitating musician is never revealed despite the incredibly close examination on film of his face as he improvises. Tim Berne’s Snakeoil. Matt Mitchell, Oscar Noriega, Ches Smith, Tim Berne. ← Haus der Kunst, Munich, 12. i. 13. Interesting post. I have collected a fair amount of ECM records over the years. Not so much recently although quite taken with Eivind Aarset’s ‘Dream Logic’. Despite the diversity and variety of musicians who have recorded for the label there is no escaping that ECM sound – as if the musicians are somehow ECM-ised. Even the likes of Evan Parker as your quote shows. Both a strength and a weakness I suppose in that it expresses Eicher’s singular vision but appears to be a label that absorbs rather than expands. I can think of a few releases that have perhaps escaped this: that early Music Improvisation Company one, ‘Urban Bushmen’ by Art Ensemble of Chicago and one of my all time favourites Julian Priester’s ‘Love Love’. Thanks for these recs. I do like Susanna and wasn’t aware she had recorded for ECM. I have a few of hers on Rune Grammofon – a label which perhaps fulfils the function that ECM used to for me. Again a pretty singular vision, distinct album artwork and a cohort of musicians who interact in all sorts of cross-genre permutations but perhaps with a playfulness that’s not too evident on ECM. Having said that there is loads of classic ECM stuff that I still love: Ralph Towner’s ‘Solo Concert’ a lot of John Abercrombie, any Kenny Wheeler and still plenty of Jarrett – esp the Gurdjieff one and Arbor Zena. Don Cherry and Ed Blackwell as well. I just lost track with ECM a bit as there is so many other great labels and artist releases out there now.